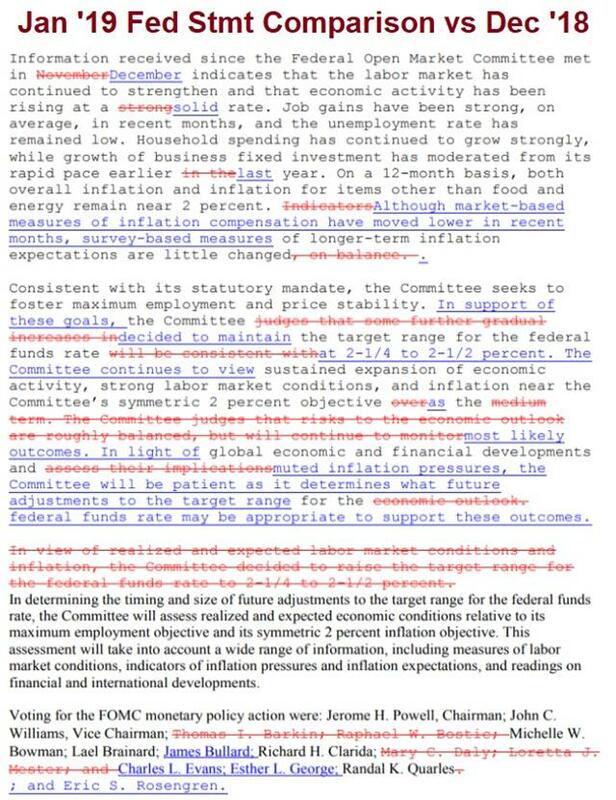 The FOMC statement made some major changes in the continued U-turn from the stubborn hawkish stance late last year. Replacing the reference to 'further gradual increases' by a phrase indicating the Fed would be patient on rates was the principal force against the USD. In addition, the reference to a roughly balanced risks was removed and economic activity was downgraded to 'solid' from 'strong'. In a separate statement the Fed also said it would be flexible in its balance sheet if needed. Powell didn't shift from that script in the press conference. He touted the domestic economy but said slower growth in China and Europe were drags, along with the government shutdown and tighter financial conditions. He also said it was difficult to indicate whether or not we're at the end of the rate hike cycle. Overall, this was a clear shift to neutral. The market had expected at least a token lean to the hawkish side but it didn't come. In response there was a classic risk-on response with the US dollar sinking and stocks rallying. EUR/USD rose to 1.1500 from 1.1420 and there were similar-sized moves across the board. With the Fed out of the way, the focus shifts back to China. Meetings between high-level officials will continue Thursday in Washington but in the meantime the January official manufacturing and non-manufacturing PMIs are due. The numbers are undoubtedly managed but any tick lower from the 49.3 and 53.8 readings previously would raise concern. They're both due out at 0100 GMT. USD/CAD was another big mover Wednesday as it fell to the lowest since early November and cut through the 100-dma and (briefly) the 200-dma. A nearly 2% rally in WTI crude to a two-month high gave the loonie a further boost. But watch out for data in the day ahead. Canadian November GDP is due at 1330 GMT and expected to contract 0.1%. Recent data on retail sales, inventories, trade and whole sale sales points to the chance for a downside surprise and that could quickly erase the loonie's progress.